WARNING: The post ahead contains content that is… healthy. I know, you come here expecting cake upon cookie upon more cake and cookies, but it’s January, the month of not-yet-broken New Years resolutions. Just hear me out. • Peanuts have more energy-boosting protein than any other nut so you become satisfied quicker and keep going longer whether you’re working, studying, or exercising. Okay, knew that one. • With over 30 vitamins and nutrients such as folic acid, vitamin E, niacin, phosphorous, and magnesium, it is no surprise that peanuts are a Super Food. Huh – not too shabby. • Peanuts beat broccoli, carrots, and green tea in the antioxidant count. Wow – nice. Finally, a little light at the end of the tunnel; maybe I wouldn’t be going to town on a chocolate peanut butter cupcake just yet, but I could at least enjoy one of my favorite college-era breakfasts: an apple with peanut butter. If you’re a fan of Rachael Ray, you may have come across one of her “bottom of the jar” recipes. I was sincerely in the mood for Peanut Butter & Co’s yummy The Bee’s Knees Peanut Butter but was disappointedly out of it. I had 1/4 cup of peanut butter left in a jar of Saratoga’s Organic Plain Jane Creamy and Rachael Ray’d it with a drizzle of honey. Presto! I had an instant mini-supply of honey peanut butter, and I didn’t even dirty a separate bowl (an extra plus when you’re sick an don’t feel like doing the dishes). If you’re sitting there thinking “that’s all well and good, but where’s the chocolate?”, believe me I’ve been racking my brain for ways to get my chocolate fix that won’t reverse all of my hard-fought detoxing. I’ve been cheating with little bites of dark chocolate here and there (which they claim is full of antioxidants, so really it’s not drastic cheating). I conveniently had a little stash of Raaka’s Raw Chocolate on hand. I’ve tried their 70%, Dark w/Sea Salt and Blueberry Lavendar but their Hazelnut is far and away my favorite. The faintly grainy texture of the raw chocolate worked really nicely with the robust hazelnut flavor. Since with raw chocolate, they skip the roasting process, more antixoxidents remain in the chocolate. Win/Win. For more tasty raw chocolate, check out my previous post on Fearless Chocolate. I have also been downing Odwalla and Naked drinks like it’s my job. They are packed full with fruits, veggies and vitamins and Odwalla even has a Chocolate Protein shake that’s full of essential amino acids, vitamins and minerals. 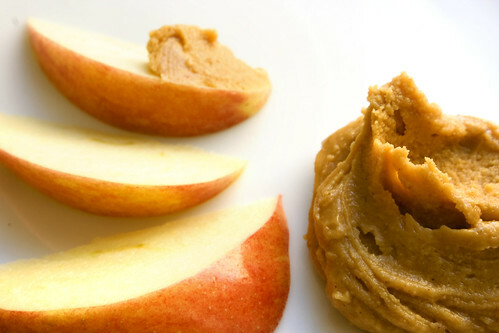 If you want to add a little something extra, try tossing it in a blender with a little peanut butter. Yum! Check out my simple Bottom of the Jar Honey Peanut Butter recipe after the break. And if you’re sick too, I hope these eats help you feel better soon! Add the honey to the peanut butter jar and stir until combined. Serve with your favorite type of apple. I took the photos with a Gala, but it wasn’t that tasty of an apple so later switched to a Granny Smith. Yes! I love Saratoga PB — I have the pleasure of buying directly from them at Farmer’s Markets :) I actually had an apple and some Plain Jane chunky for a snack earlier! First of all, feel better soon! That is terrible that it’s been lingering since October! You poor thing!! 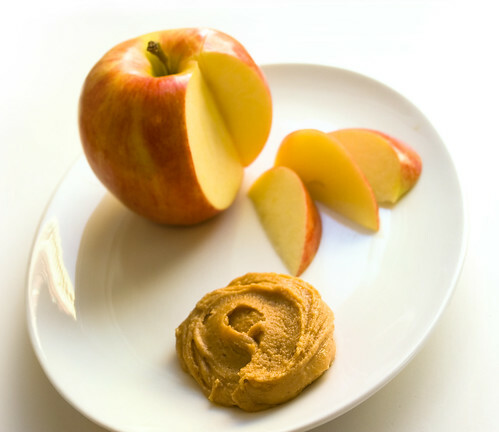 And also, apples and peanut butter always make me feel better! Great tip!